Diabetes Mellitus (Sugar Diabetes) is a common disease in which a cat’s body is either not producing enough insulin, or is not able to properly use the insulin that is present. This latter condition is called ‘insulin resistance’. Insulin is a hormone which regulates the flow of glucose from the bloodstream into the cells of the body by acting like a door which opens to allow the glucose into the cells. If there is insufficient insulin present (or that which is present is not functioning properly) then the door will not open and the glucose cannot get to the cells/tissues. With the excess glucose taking essential water from the body, your cat will urinate more frequently; and will need to drink more water in an attempt to compensate. Because the glucose cannot reach the cells that need it for energy, the cells cannot function properly. The cat will then eat more food in the vain attempt to increase the glucose supply which its body desperately needs. This attack on the body on two fronts will, if left untreated, lead eventually to the death of the cat. There are a number of different causes of diabetes in cats, and these include hormonal imbalances, pancreatic disease (the pancreas is where the insulin is produced), age, certain medications (such as steroids and Megestrol Acetate), and a genetic predisposition. 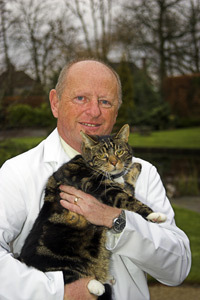 However, experience has shown that an overweight or obese cat is far more likely to develop diabetes than a cat of normal weight; and it is terribly sad that so many cats are brought into our surgeries suffering from this life threatening illness when it could have been avoided by simply feeding our cats with the correct diet. Regardless of the cause, the main and earliest sign of diabetes will be an increased thirst. Our feline friends are notorious for not drinking a great deal, so if you notice that your cat appears to be drinking more than usual this may well be your first warning sign. If your cat is drinking more then it will need to pass more urine. If the cat uses a litter tray then this habit will quickly become obvious to you, but for the outdoor cat, it is much more difficult to spot. If the disease has been present for a while an increased appetite will be noticed, but because the body is unable to utilise the glucose in the food the cat will start to lose weight despite the increased intake of food. Very often the weight loss is mainly from the muscles, causing a thin back and an apparent larger belly due to the weakening muscles. Another cause of weak muscles is a condition called ‘peripheral neuropathy’ – meaning that the nerves to the muscles stop working efficiently. This causes very weak legs and has the effect of making your cat appear drunk. As the condition progresses a dull and frequently matted coat, reduced activity, and secondary infections become common. As is clear from the foregoing, if you suspect that your cat is drinking more then do take him/her to your vet. The symptoms I have described can also be caused by other problems, so in addition to a thorough clinical examination and discussion with you, a blood test may well be recommended. This is the only way to ascertain the level of glucose in the blood and to rule out other potential diseases. Unfortunately, an initial high sugar level is still not total confirmation that diabetes is present. The stress of being taken to the vets can itself cause a very temporary increase in the production of excess glucose. Therefore a further test looking for a chemical called ‘Fructosamine’ will be necessary. A high initial glucose level, together with a high Fructosamine level and the clinical signs already described, are enough to confirm that your cat is suffering from Diabetes Mellitus. Diabetes can sometimes be associated with or caused by, other diseases so this is why a full examination and comprehensive series of blood tests are required. Once diabetes has been diagnosed it is very important that treatment is started straight away; and will largely depend upon the severity of the disease, and the history surrounding the particular cat. There are no effective oral medications for this condition in cats, so the diabetes can only be controlled by giving once or twice daily insulin injections under the skin. There are different types of insulin and you will have to be guided by your own vet’s experience as to which one is most appropriate. A ‘glucose curve’ will have to be performed either at your vet’s surgery or ideally at home to decide if the insulin is working well or not. It may be necessary to change the insulin once or even twice to find the right one for your cat. 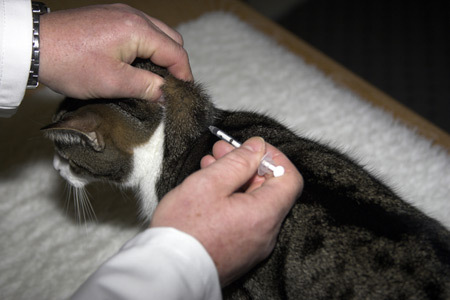 The thought of giving your cat injections at home might well frighten you, but you will be surprised how easy this is once your vet has shown you how, and when you realise that it is not painful for your cat. The needles in the disposable syringes are extremely fine and, as long as they are only used once, they are also very sharp. Hence your cat really doesn’t feel anything. Because all cats are different, the type of insulin used, and the amount and frequency of the injections will be determined by your vet, and regular monitoring of blood sugar levels will be necessary. I will cover the matter of monitoring later on. In a large proportion of overweight cats, weight loss and insulin injections can reverse the condition and insulin treatment stopped. Others may require treatment for the rest of their lives. Insulin is provided in small bottles, and it is very important that these are kept in a refrigerator. They must never be shaken but, because the contents need to be mixed, the bottle should be rolled gently in the hand prior to injecting your cat. Insulin pens are available for cats, and they can be easier for owners to use; but the drawback to them is that it can be difficult to make small changes to the dose. Some cats can also have a thicker skin which may also cause problems. It is vital that a strict timing regime is observed, but most owners find that both their cat and they themselves fall into a routine quite easily; with the timing of meals ideally linked to the timing of the injections. An overdose of insulin is extremely dangerous, causing lack of coordination, listlessness, convulsions and coma. This is called hypoglycaemia, and death may result if it is left untreated. If hypoglycaemia occurs, the cat should immediately be offered its normal food in order to increase the level of sugar. Alternatively, a glucose solution can be given slowly into the mouth with a syringe. You must contact your vet immediately if this occurs so that further treatment instructions can be given. This is also why constant monitoring is so necessary. Should your cat’s diabetes reverse you need to be aware of this and be ready to reduce or stop the insulin before any hypoglycaemia develops. As I have said earlier, a vast number of diabetic cats are overweight, and treatment will, therefore, include weight control. Your vet can advise you on a safe weight-loss programme to enable your cat to lose weight gradually. Some cats respond well to a low-carbohydrate diet, others to higher fibre diets. Trial and error with help from your vet will determine the best diet for your particular cat. If your diabetic cat is overweight I cannot stress too strongly the importance of helping him/her to lose weight. Once your vet has determined the right type of insulin for your cat, the dose and frequency with which it needs to be administered, and you are comfortable injecting him/her; the all-important matter of monitoring the glucose levels must be addressed. Your cat’s insulin requirements may change over time or, as I have said earlier, his/her need for injections may cease entirely. It is, therefore, vital that regular monitoring is undertaken. Your vet will have been doing this in the early stages in order to tailor the treatment to the specific needs of your cat, and he/she will then advise you how to undertake the glucose monitoring at home. For many years the most popular method of home monitoring relied upon the cat’s willingness to use a litter tray containing non-absorbent crystals to collect the urine. Within two hours of the cat urinating the pet owner had to dip a veterinary supplied ‘dip-stick’ into the urine. The stick changes colour, and this is compared to a colour chart which indicates different levels of glucose in the urine. 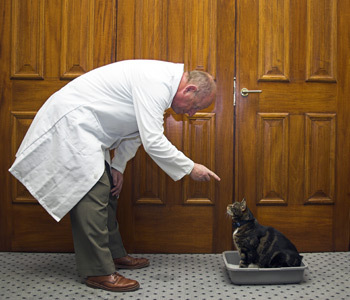 Unfortunately we vets do not have a trick to persuade your cat to urinate when it’s time for you to take the test. Furthermore, the dipstick method is not nearly as accurate as blood testing and can be very misleading – and for this reason dangerous. Therefore regular visits to your vet for blood sampling remain essential. A more reliable (and less expensive) method of home monitoring is now easy for you to undertake yourself – as long as you stick to the advice given to you by your vet. The process involves the use of a ‘glucometer’ – just as human diabetics do. There is a range of different glucometers available. Some cat owners prefer to use those designed for humans; others choose those created specifically for cats and dogs. I recommend that you discuss the type of glucometer with your vet. With the glucometer you will have test strips and small lancets. You will also need some cotton balls or small gauze squares. Have your cat sitting or lying on your knee, or beside you on a chair. Stroke him to make sure that he is relaxed, and fondle his ears to ensure that they are warm. If they are cold then gently apply a warm clean cloth to the ear you have decided to take the sample from. Blood will flow more easily in a warm ear. Along the outer edge of the ear you will see a thin blood vessel. Note the thin red line (which is the blood vessel) running along the outer edge towards the tip of the ear. Hold a cotton ball or wad of gauze inside the ear under the blood vessel. This provides a firm cushion for the ear. 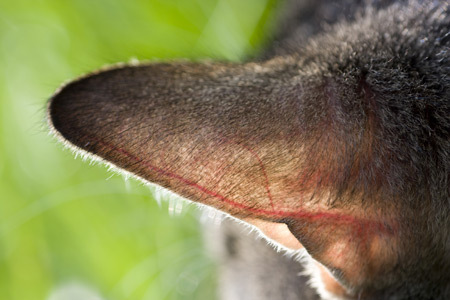 With the other hand, and using one of the lancets provided, prick the blood vessel once from the outside of the ear – about halfway up to where it will cause less discomfort for your cat. If you have done this correctly then a small drop of blood will form on the ear. Do not let go of the ear because your cat will most likely flick the blood away. Depending upon which type of glucometer you are using, you either touch the test strip to the drop of blood and place it into the meter, or you hold the tip of the strip already positioned in the meter to the blood on the ear. Make sure that you follow the instructions for the particular meter you are using. Many people, including veterinary nurses, find it better to use a fine hypodermic needle to prick the vein. Some types of lancets can be quite tricky to use and most are designed for human skin rather than cat skin. When you have undertaken the test gently but firmly hold the cotton ball or gauze on the spot you took the sample from. This usually stops any further bleeding. Now give your cat a treat from his dietary allowance. Do this even if your first attempt was unsuccessful. He deserves to be rewarded! Record the date, time and the blood glucose value recorded on your glucometer. You should now give yourself a treat as well! You have taken a huge step towards your cat’s wellbeing. Instead of him/her suffering the stress of constant visits to the vets, your cat’s glucose levels is now being monitored in the familiar and comfortable surroundings of your home. Well done! Your vet will tell you how to record the meter readings to show the resultant glucose ‘curve’ in the best format, and also how frequently he/she needs to see it in order to ascertain if the amount or frequency of the dosage needs to be modified at any time. Managing a diabetic cat requires good communication between you and your vet, and can be very rewarding. Depending upon the underlying cause of diabetes, and if you are willing to dedicate the time to the monitoring, your cat may have many more happy years with you. Numerous owners of diabetic cats have found that the constant attention which accompanies the monitoring procedure has resulted in the development of a much closer bond with their pet. Samantha Taylor’s truly excellent lecture on “The Diabetic Cat: more than just insulin injections”, for the Feline Friends Academy for cat owners, covered this extremely challenging subject in her usual indomitable manner. Sam is an RCVS Recognised Specialist in Feline Medicine, and I really do recommend that you watch the recording of her lecture by clicking on the picture below. "I love cats because I love my home, and little by little they become its visible soul"